This beautifully handcrafted life-like plush is manufactured in the highest quality materials, with meticulous attention to detail, by a company with nearly 60 years experience. 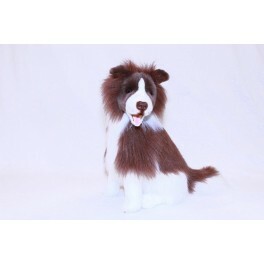 Brandy is a brown and white border collie (sheep dog) is manufactured by Bocchetta Plush Toys Australia. Baxter is a 38cm (15 inch) standing English Bulldog. A 25 cm size plush toy from Keel Toys.